The clinic will be closed from 29th of April to 8th of May. The clinic will be closed on 21st of March. ★：Sunday afternoon, office will be closed at 17:30. 3 minutes walk from west exit of JR Shinjuku station. 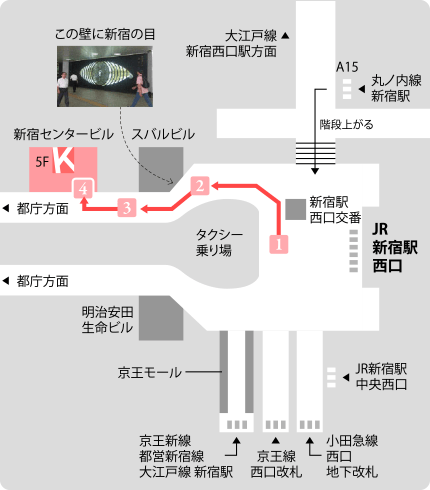 We recommend taking access from underground of west exit Shinjuku. Please walk toward the taxi station where is opposite side of JR Shinjuku station. When you see the direction board of Shinjuku Center Bldg, please take a right. There is "the eye of Shinjuku" on the wall, please passe by it. After keep walking, you can see the direction of Shinjuku Center Bldg. Please take an escalator to Shinjuku Center Bldg, and then after take an elevator to 5th floor.